A Boat Bill of Sale is used for transferring the ownership of a watercraft (motorized or non-motorized) from one party to another. The document should contain the itemized prices if any motor(s) or trailer(s) are included in the sale. 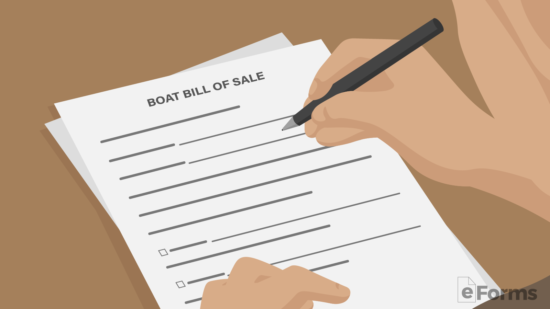 The bill of sale should only be filled-in and signed by the parties when the boat has been delivered by the seller and the funds have been made available by the buyer. What is a Boat Bill of Sale? What is Needed to Sell a Boat? When you have made the decision to sell your boat, a Bill of Sale is one of the many essential documents needed to make the transfer of title successful. Whether purchasing or selling a boat privately or commercially, a Bill of Sale must be included in the transaction. 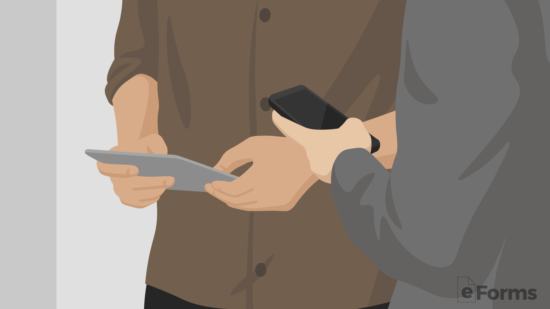 A Bill of Sale helps protect the buyer from accusations of fraud by showing proof of payment in good faith while also protecting the Seller if any problems are to arise after the sale. Types of vessels/boats that can be bought or sold using this Boat Bill of Sale: Cabin Cruiser, Canoe, Ferry, Fishing Boat, Jet Ski, Kayak, Yacht, Powerboat, Rowboat, Sailboat, Skiff, Tugboat. 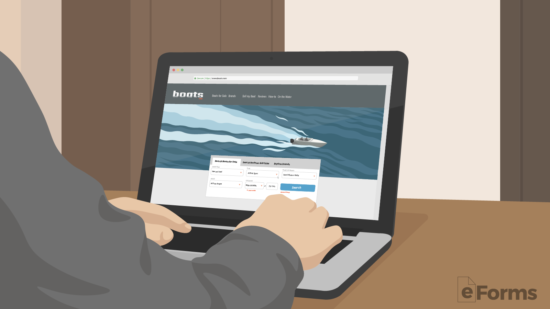 Boat – The boat’s condition and specifics which include the Make, Year, Title Number, Hull ID and Odometer reading are to be inscribed in the Bill of Sale. If there is a trailer and/or a motor also being bought/sold in the sale, including the specifics of those items. Buyer – The Name and Signature of the purchasing party. Seller – The Name and Signature of the party offering an item of purchase. Purchase Price – The amount to be given from the buyer to the seller in exchange for the vessel. Location – In the Certificate of Acknowledgement, name the County and State in which the transaction takes place. 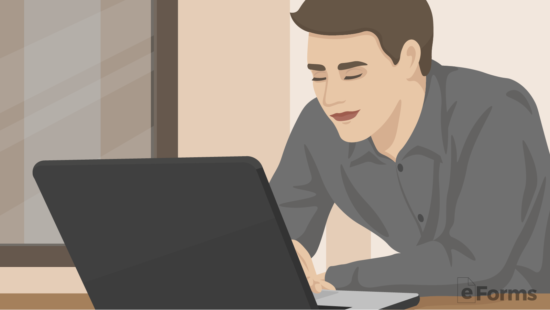 Before we can divulge into the Bill of Sale process, we need to learn the proper steps prior to completing a Bill of Sale. This explanation is written in the eyes of the seller. When an individual decides to sell their boat he or she must decide what will be going along with the boat including, but not limited to, outboard motor(s), trailer(s), life jackets, and other gear. Whether or not these items are included will determine the final value of the sales price depending if it’s wanted by the buyer. 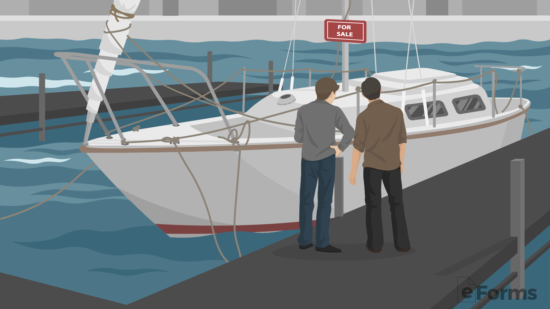 Step 2 – How Much is Your Boat Worth? This will most likely be the most difficult part of the process. Most owners know, more or less, the value of their boat. In the chance you do not know the value, using www.nadaguides.com can give you a general range of what to look for. Otherwise, a seller’s best bet is to look up what the exact make, model, and year of the boat is selling for in your market. Hiring a Broker – Generally, if the boat will be selling for more than $40,000 then it’s best to hire a broker at a local marina. They will not only list it for the fair market value but also clean the boat and presentable to potential buyers. Selling it Yourself – If the value is under $40,000 then it’s advised to sell the boat yourself. Most brokers will not accept a boat lower than this amount. Before you even think about listing your boat online or with a broker, it’s a good idea to clean and brush up your boat, whether that’s by making cost worthy repairs or by hiring a cleaning service to give your boat the best opportunity to sell. First impressions can go along way. Depending on the location of the boat it can be a challenge to show to potential buyers. For example, if your boat is on a mooring, it will be harder for potential buyers to see its exterior as you will need to skiff people to and from the boat every time someone wants to take a look. The best possible option is to have your boat stationed to a dock for easy access, this way buyers can get a true sense of what it’s like to be on your boat in the water. If docking is not a viable option, the next best and cheapest way of viewing is to park your boat on land. Either placed in a trailer or positioned on a stand. All States require that a boat bill of sale form (Download) be signed by the buyer and seller in order to complete the sale. The parties may also use the form to record the sale of the outboard motor and trailer. Copies of the should be given to each party with the buyer requiring a copy for registering and obtaining title with the State. Seller – Title (signed over to the buyer) and any current registration documents. The buyer and seller will have to negotiate which party will be subject to the sales tax (%). In most transactions, this is split between the parties. 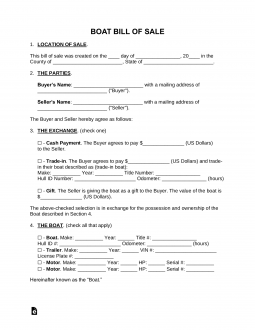 In most States, the buyer is required to immediately register the boat after the sale has been completed. This is commonly completed by providing the State with the signed bill of sale and title forms along with any registration documents. Depending on the State, there may be a sales tax which is required to be paid at this time. 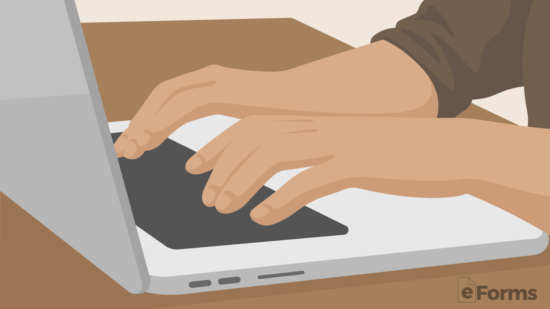 If the seller accepted partial responsibility for it, it still must be paid by the buyer.